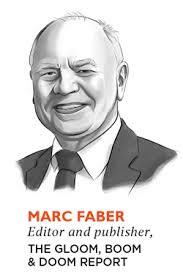 "Young adults will earn less than their parents and die with less than their parents," Faber said, noting parents — when young — bought U.S. Treasury bonds paying 7 percent rather than bonds paying nothing today. They bought homes that appreciated greatly. Now, "young people don't have money to buy condos and houses," so they overpay on rent and are left without money to invest or spend. He blames central banks. "It's ludicrous to think that slashing rates will get people to spend." When rates are low, he says, you feel insecure as savings earn nothing. So, "you save more."